If you love diving and wish to make a career out of it, our PADI Career Development Center is here to help. We run the full range of the PADI recreational dive courses as well as all of the professional level courses. The first part of your PADI professional level is the PADI Divemaster Course. We would usually recommend people to take about 5 weeks to complete the course allowing you to take full advantage of the facilities here at our PADI CDC Center in Gili Trawangan. The PADI Divemaster rating allows you to work as a training assistant on PADI courses and programs, supervise certified divers during pleasure diving experiences, and conduct some PADI programs independently. Becoming a PADI Divemaster consists of the following segments: knowledge development, practical application and the Divemaster final exam. Once you have completed the PADI Divemaster Internship you will go on to the PADI Instructor Development Course (IDC) and learn to adequately deliver the full range of PADI programs. 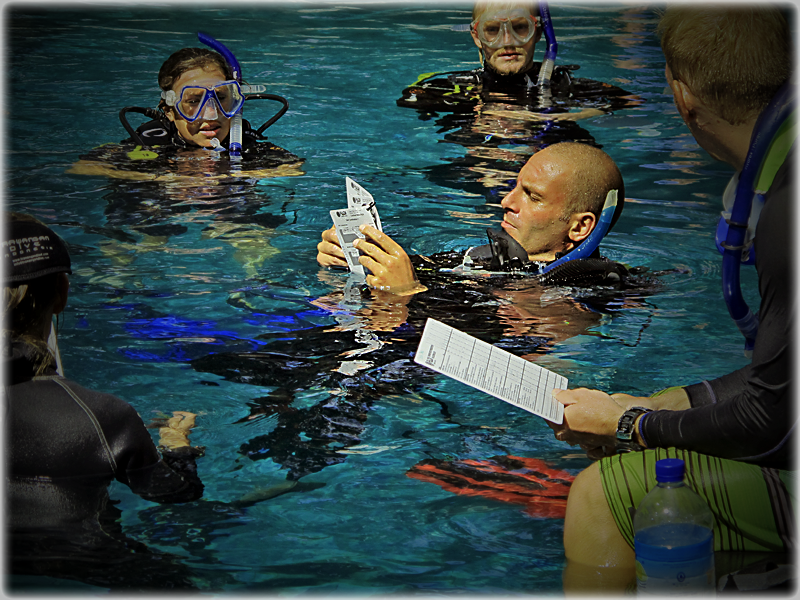 Our PADI IDC Course is taught over the length of 11 days with a recommended 4 days of pre-IDC prep. Trawangan Dive is certainly the place to take your professional level PADI training. We are the only PADI Career Development Center (CDC) in the Gili Islands and one of only a handful in Indonesia. Our PADI Course Director is one of only 66 Platinum rated PADI Course Directors in the world and our philosophy is to train instructor’s way beyond the PADI requirements and to higher standard than is generally expected within industry. Most of our previous Instructor candidates have gone on to gain highly successful careers as PADI Professionals both here in the Gili Islands and worldwide. If you’re looking for a highly rewarding career as a PADI professional and want to join one of our exclusive PADI Career Development Programs simply Contact the Gili GoPro Instructor team and book your place on the course. All it take is a short stroll around Gili Trawangan talking to the various Instructors to find out about the PADI IDC program here at Trawangan Dive and how its transformed their lives and given them a brand new career with the knowledge and confidence to pass on the PADI education system, whilst teaching people to dive. Other ways of finding out about the course is to take a look at our IDC Indonesia website, which has all the information about our programs and includes a full PDF brochure outlining dates, prices, schedules and much more. Another useful way to see how past and present candidates got on is to check out our PADI IDC Indonesia Facebook Page. Terima Kasih.., Sangat Bermanfaat Sekali. Oya, saya punya banyak sekali koleksi Emban Perak | Emban Alpaka | Emban Cincin | Emban Akik | Emban Titanium | Batu Combong | Cincin Perak | Cincin Akik | Gagang Cincin | Terima Kasih atas Kunjungannya. Salam Persaudaraan dari saya. So I have purchased my first Open water scuba lessons,what is to be expected? They told me in order to get my diving license I need to take a written test,have 1 pool dive and 5 open water dives.What are they going to have me do on the written test? and is there any way I can prepare for it? also what will I be learning on the open water dives?